North Korea has carried out a "successful" ground test of a new rocket engine to launch satellites, state media says. 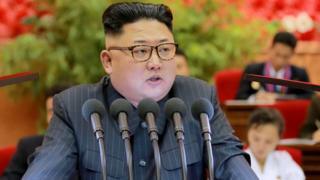 Kim Jong-un, the country's leader, asked scientists and engineers to make preparations for a satellite launch as soon as possible, KCNA reported. It is the latest in a series of missile-related tests this year. Meanwhile, the US and China have agreed to step up co-operation at the UN to address the North's fifth nuclear test. The underground nuclear test, conducted earlier this month, is thought to be the country's most powerful yet. North Korea regularly makes claims about the progress of its nuclear and missile programmes, but analysts say most of them are impossible to independently verify. US and Chinese officials have started discussions on a possible UN sanctions resolution as a response, unnamed diplomats were quoted by the Reuters news agency as saying. But Beijing has not said directly whether it will support tougher steps against Pyongyang, the agency added. China is North Korea's main ally and trading partner, but has grown increasingly intolerant of its military actions and Kim Jong-un's aggressive rhetoric. Its support for toughened sanctions is crucial if they are to have any impact, but Beijing has repeatedly said that such steps are not the ultimate answer for the issue. Kim Jong-un supervised the test at the country's Sohae satellite-launching site, KCNA reported. That is where the country launched a rocket in February, reportedly carrying a satellite. The engine tested would give the country "sufficient carrier capability for launching various kinds of satellites, including Earth observation satellite at a world level", the report added. Mr Kim, KCNA said, called for more rocket launches to turn the country into a "possessor of geostationary satellites in a couple of years to come." This was seen by observers as an indication that Pyongyang might soon launch another long-range rocket. The North insists its space programme is purely scientific in nature but the US, South Korea and even China say the rocket launches are aimed at developing inter-continental ballistic missiles. UN Security Council resolutions ban the state from carrying out any nuclear or ballistic missile tests. What impact will S Korea's expanded missile defence system have? Why cut off social media in Sri Lanka?